Denial of the Holodomor (Ukrainian: Заперечення Голодомору, Russian: Отрицание Голодомора) is the assertion that the 1932–1933 Holodomor, a man-made famine in Soviet Ukraine, did not occur or diminishing the scale and significance of the famine. This denial and suppression of information about the famine was made in official Soviet propaganda from the very beginning until the 1980s. It was supported by some Western journalists and intellectuals. It was echoed at the time of the famine by some prominent Western journalists, including Walter Duranty and Louis Fischer. The denial of the man-made famine was a highly successful and well orchestrated disinformation campaign by the Soviet government. According to Robert Conquest, it was the first major instance of Soviet authorities adopting the Big Lie propaganda technique to sway world opinion, to be followed by similar campaigns over the Moscow Trials and denial of the Gulag labor camp system. Only in the post Soviet era, independent Ukraine has officially condemned the Holodomor as an act of genocide against the Ukrainian people. The causes, nature, and extent of the Holodomor remain topics of controversy and active scholarship, including the debate over whether or not it constitutes genocide. Soviet head-of-state Mikhail Kalinin responded to Western offers of food by telling of "political cheats who offer to help the starving Ukraine," and commented, "Only the most decadent classes are capable of producing such cynical elements." 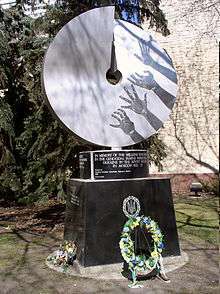 The Soviet Union denied existence of the famine until its 50th anniversary, in 1983, when the worldwide Ukrainian community coordinated famine remembrance. The Ukrainian diaspora exerted significant pressure on the media and various governments, including the United States and Canada, to raise the issue of the famine with the government of the Soviet Union. In February 1983, Alexander Yakovlev, the Soviet Ambassador to Canada, in a secret analysis "Some thoughts regarding the advertising of the Ukrainian SSR Pavilion held at the International Exposition "Man and the world" held in Canada" put forward a prognosis for a campaign being prepared to bring international attention to the Ukrainian Holodomor which was spearheaded by the Ukrainian nationalist community. Yakovlev proposed a list of concrete proposals to "neutralise the enemy ideological actions of the Ukrainian bourgeoise nationalists". Former Ukrainian president Leonid Kravchuk recalled that he was responsible for countering the Ukrainian Diaspora's public education campaign of the 1980s, marking 50 years of the Soviet terror famine in 1983: " In the early 1980s many publications began appearing in the Western press on the occasion of the fiftieth anniversary of one of the most horrific tragedies in the history of our people. A counter-propaganda machine was put into motion, and I was one of its wheels." First book on the famine was published in Ukraine only in 1989, after a major shake-up that occurred in the Communist Party of Ukraine when Volodymyr Ivashko replaced Volodymyr Shcherbytsky and the Political Bureau decided that such book can be published. However, even in this book, "the most terrifying photographs were not approved for print, and their number was reduced from 1,500 to around 350." Duranty was well aware of the famine. He told in private to Eugene Lyons and reported to the British Embassy that the population of Ukraine and Lower Volga had "decreased" by six to seven million. However, in his reports, Duranty downplayed the impact of food shortages in Ukraine. As Duranty wrote in a dispatch from Moscow in March 1933, "Conditions are bad, but there is no famine... But—to put it brutally—you can't make an omelet without breaking eggs." Duranty also wrote denunciations of those who wrote about the famine, accusing them of being reactionaries and anti-Bolshevik propagandists. In August 1933, Cardinal Theodor Innitzer of Vienna called for relief efforts, stating that the Ukrainian famine was claiming lives "likely... numbered... by the millions" and driving those still alive to infanticide and cannibalism. The New York Times, August 20, 1933, reported Innitzer's charge and published an official Soviet denial: "in the Soviet Union we have neither cannibals nor cardinals". The next day, the Times added Duranty's own denial. Campaigns were launched in 1986 for the retraction of the Pulitzer Prize given to The New York Times. The newspaper, however, declined to relinquish it, arguing that Duranty received the prize for his reporting several years before the occurrence of the famine. While conceding that Duranty's coverage of the famine has since been "largely discredited", the Times noted that: "Duranty's cabled dispatches had to pass Soviet censorship, and Stalin's propaganda machine was powerful and omnipresent. Duranty's analyses relied on official sources as his primary source of information, accounting for the most significant flaw in his coverage - his consistent underestimation of Stalin's brutality." The lack of knowledge of the famine was observed by English writer George Orwell, who commented that "huge events like the Ukraine famine of 1933, involving the deaths of millions of people, have actually escaped the attention of the majority of English Russophiles". In 1945, Orwell wrote, "[I]t was considered equally proper to publicise famines when they happened in India and to conceal them when they happened in the Ukraine. And if this was true before the war, the intellectual atmosphere is certainly no better now. Nigel Colley has written on the influence of the Ukrainian famine, and the Holodomor denial of Duranty, on Orwell's book Animal Farm. In 1980s Soviet Communist Party approached the Canadian Communist Party to engage journalist Douglas Tottle to prepare counter-propaganda materials under the title "Fraud, Famine and Ukrainian Fascism". Before final publication, the official reviewers of the tome in Kiev suggested that the name of the book be changed, as stated in their explanation "Ukrainian fascism never existed". In 1987, the Canadian trade-unionist and activist Douglas Tottle, published the controversial book Fraud, Famine, and Fascism: the Ukrainian Genocide Myth from Hitler to Harvard, in which he asserts that claims the Holodomor was an intentional genocide are "fraudulent", and "a creation of Nazi propagandists". His book, published by Progress Publishers in Toronto, appeared around the same time Ukrainian Communist party leader Volodymyr Shcherbytsky publicly acknowledged the famine, in December 1987. As a result, the book was subsequently withdrawn from circulation. In a review of Tottle's book in the Ukrainian Canadian Magazine, published by the pro-Communist Association of United Ukrainian Canadians, Wilfred Szczesny wrote: "Members of the general public who want to know about the famine, its extent and causes, and about the motives and techniques of those who would make this tragedy into something other than what it was will find Tottle's work invaluable" (The Ukrainian Canadian, April 1988, p. 24). Some of Tottle's material appeared in a 1988 article in the Village Voice, "In Search of a Soviet Holocaust: A 55-Year-Old Famine Feeds the Right". The issue of the Holodomor has been a point of contention between Russia and Ukraine, as well as within Ukrainian politics. According to opinion polls, Russia has experienced an increase in pro-Stalin sentiments in since the year 2000, with over half viewing Stalin favourably in 2015. There has also been steady increase in the number of Ukrainians viewing the Holodomor as an act of genocide, from 61% in 2010 to 80% in 2015. Since independence, Ukrainian governments have passed a number of laws dealing with the Holodomor and the Soviet past, with the latest being the "Decommunization laws" of 2015. The Russian government does not recognize the famine as an act of genocide against Ukrainians, viewing it rather as a "tragedy" that affected the Soviet Union as a whole. A 2008 letter from Russian president Dmitry Medvedev to Ukrainian president Viktor Yushchenko asserted that the famine "was not targeted at exterminating of any single nation", and accused Ukraine of exploiting it for political ends. In November 2010 a leaked confidential U.S. diplomatic cable revealed that Russia had allegedly pressured its neighbors not to support the designation of Holodomor as a genocide at the United Nations. According to another leaked document, Russian Foreign Minister Sergey Lavrov described Israel's recognition of the Holodomor as "historical revisionism". In 2006, the All-Ukrainian Public Association “Intelligentsia of Ukraine for Socialism” published a pamphlet titled "The Myth of the Holodomor" by G. S. Tkachenko. The pamphlet claimed that Ukrainian Nationalists and the US government were responsible for creating the "myth." Russian publicist Yuri Mukhin has a published a book titled "Hysterical Women of the Holodomor", dismissing Holodomor as "Russophobia" and "a trump card of the Ukrainian Nazis." Sigizmund Mironin’s “Holodomor in the Rus” argued that the cause of the famine was not Stalin's policies, but rather the chaos engendered by the New Economic Policy. Russian state media ran several articles denying the severity and causes of the Ukrainian famine. In an article on Russia Today, Boris Borisov attempted to equate the Soviet famine of 1932-33 to the Great Depression in the United States, which he claimed killed 7.5 million people. The claim was featured on several websites devoted to conspiracy theory.. Sputnik News ran two articles on the "Holodomor Hoax", promoting the view that the Holodomor was a product of Nazi and Cold War propaganda. One of the articles cited Nikolai Starikov's claim that the famine was caused by a Western "gold blockade", which forced the USSR to pay for machinery with grain. A draft law "On Amendments to the Criminal and the Procedural Criminal Codes of Ukraine" was submitted by President Viktor Yushchenko for consideration by the Ukrainian Parliament. The draft law envisaged prosecution for public denial of the Holodomor Famine of 1932–1933 in Ukraine as a fact of genocide of the Ukrainian people, and of the Holocaust as the fact of genocide of the Jewish people. The draft law foresaw that public denial as well as production and dissemination of materials denying the above shall be punished by a fine of 100 to 300 untaxed minimum salaries, or imprisonment of up to two years. The draft law, however, failed to receive support from incoming President Viktor Yanukovych, who, following his inauguration in 2010, declared: “it would be wrong and unfair to recognize the Holodomor as an act of genocide against one nation”—this among a number of actions seen as his pursuing a more Russocentric policy. However, in 2011 he stated: "Terrible years of totalitarianism have been a spiritual catastrophe: numerous churches were demolished, hundreds of thousands of peasants, workers, and intellectuals were physically eliminated or sent to the Gulag camps, almost every Ukrainian family suffered," and in 2012 affirmed: "This crime has changed the history of Ukrainian people forever. It has been one of the severest challenges of Ukrainians. Holodomor not only killed people, but also had the purpose of causing fear and obedience." ↑ Robert J. Sternberg; Karin Sternberg (28 April 2008). The Nature of Hate. Cambridge University Press. p. 67. ISBN 978-0-521-89698-6. Retrieved 5 November 2015. 1 2 3 4 Richard Pipes Russia Under the Bolshevik Regime, Vintage books, Random House Inc., New York, 1995, ISBN 0-394-50242-6, pages 232-236. 1 2 3 Edvard Radzinsky Stalin: The First In-depth Biography Based on Explosive New Documents from Russia's Secret Archives, Anchor, (1997) ISBN 0-385-47954-9, pages 256-259. According to Radzinsky, Stalin "had achieved the impossible: he had silenced all the talk of hunger... Millions were dying, but the nation hymned the praises of collectivization". ↑ Library of Congress Subject Headings. Library of Congress. 2012. p. 8. Retrieved 5 November 2015. According to US Library of Congress subject headings, the "Holodomor denial" literature includes works that "diminish the scale and significance of the Ukrainian famine of 1932-1933 or assert that it did not occur"
↑ "Famine denial". The Ukrainian Weekly. 14 July 2002. Retrieved 4 November 2015. ↑ Dinah Shelton (2005). Encyclopedia of genocide and crimes against humanity. Macmillan Reference. p. 1055. ISBN 978-0-02-865850-6. Retrieved 5 November 2015. The Soviet Union dismissed all references to the famine as anti-Soviet propaganda. Denial of the terror-famine declined after the Communist Party lost power and the Soviet empire disintegrated. ↑ Robert Conquest (1987). The Harvest of Sorrow: Soviet Collectivization and the Terror-famine. Oxford University Press. p. 308. ISBN 978-0-19-505180-3. ↑ Robert Conquest The Dragons of Expectation. Reality and Delusion in the Course of History, W.W. Norton and Company (2004), ISBN 0-393-05933-2, page 102. ↑ There were numerous incidents of cannibalism, both killing people to eat them and the consumption of the already dead. Davies & Wheatcroft. The Years of Hunger, p 421. ↑ Conquest, Robert (30 July 1999). "How Liberals Funked It". Hoover Digest (3). Retrieved 4 November 2015. ↑ Boriak, Hennadii (Fall 2001). "The publication of sources on the history of the 1932-1933 famine-genocide: history, current state, and prospects". Harvard Ukrainian Studies 25 (3-4): 167–186. ↑ Michael Lawriwsky (22 October 2003). "The Great Famine of 1932-33 A Symposium" (PDF). National Europe Centre at the Australian National University and the Australian Federation of Ukrainian Organisations. pp. 4–5. Archived from the original (PDF) on 16 October 2004. ↑ Tucker, Robert (1992). Stalin in Power. Norton & Company. p. 191. ISBN 0-393-30869-3. 1 2 Lyons, Eugene (1991). "The Press Corps Conceals a Famine". Assignment in Utopia. Transaction Publishers. pp. 572, 573. ISBN 0-88738-856-6. ↑ Charen, Mona (2004). Useful Idiots. HarperCollins. p. 87. ISBN 0-06-057941-2. ↑ Woods, Thomas (2004). "The New York Reporter who covered up Stalin's crimes". The Politically Incorrect Guide to American History. Regnery Publishing. p. 165. ISBN 0-89526-047-6. ↑ "New York Times Statement About 1932 Pulitzer Prize Awarded to Walter Duranty". The New York Times Company. 2007. Archived from the original on 27 September 2007. ↑ Robert Conquest. The Harvest of Sorrow: Soviet Collectivization and the Terror-Famine Oxford University Press (1987), ISBN 0-19-505180-7, page 320. ↑ Markian Pelech (2003). "Correspondence between Markian Pelech and the Board of Pulitzer Prizes regarding Walter Duranty's 1932 Pulitzer Prize (December 30, 2002 – April 28, 2003)" (PDF). Retrieved 4 November 2015. ↑ "Stalin-Wells talk / the verbatim record and a discussion by G.B. Shaw, H.G. Wells, J.M. Keynes, E. Toller and others". Monash University. 2007. Archived from the original on 2 September 2007. ↑ Etienne Thevenin (29 June 2005). "France, Germany and Austria: Facing the famine of 1932-1933 in Ukraine" (PDF). colley.co.uk. Retrieved 4 November 2015. ↑ George Orwell, "Notes on Nationalism" in The Collected Essays, Journalism and Letters of George Orwell (London, 1968), Vol. 3, p. 370. 1 2 Nigel Linsan Colley (10 March 2004). "Was Gareth Jones's name behind Orwell's naming of 'Farmer Jones' in Animal Farm?". colley.co.uk. Retrieved 4 November 2015. ↑ Douglas Tottle (1987). Fraud, famine, and fascism: the Ukrainian genocide myth from Hitler to Harvard. Toronto: Progress Books. ISBN 0-919396-51-8. Retrieved 2015-12-11. ↑ Michael Pugliese (7 September 2003). "Fwd: Douglas Tottle, Fraud, Famine and Fascism (link to letter from David R. Marples)". lbo-talk.org. ↑ Roman Serbyn (1989). "The Last Stand of the Ukrainian Famine-Genocide Deniers". infoukes.com. Retrieved 4 November 2015. ↑ Serbyn, Roman. "Competing Memories of Communist and Nazi Crimes in Ukraine" (PDF). Chair of Ukrainian Studies, University of Ottawa. Archived from the original (PDF) on 6 July 2011. Retrieved 23 September 2016. ↑ Jacob W.F. Sundberg (10 May 1990). "International Commission of Inquiry Into the 1932–33 Famine in Ukraine. The Final Report (1990)". ioir.se. Retrieved 4 November 2015. ↑ Monaghan, Jennifer (31 March 2015). "Was Stalin's Terror Justified? Poll Shows More Russians Think It Was". Moscow Times. Retrieved 29 September 2016. ↑ "More Than Half of Russians See Stalin in a Positive Light". Moscow Times. January 20, 2015. Retrieved 29 September 2016. ↑ "Динаміка ставлення до Голодомору. Листопад 2015" (PDF). ratinggroup.ua. Retrieved 29 September 2016. ↑ Hyde, Lily (20 April 2015). "Ukraine to rewrite Soviet history with controversial 'decommunisation' laws". The Guardian. ↑ "Medvedev slams Ukraine's Great Famine stunt". RT. 14 November 2008. Retrieved 1 October 2016. ↑ "Candid discussion with Prince Andrew on the Kyrgyz economy and the 'Great Game'". WikiLeaks. November 2010. Retrieved 30 September 2016. He [Prince Andrew, Duke of York] stated the following story related to him recently by Azerbaijan's President Aliyev. Aliyev had received a letter from President Medvedev telling him that if Azerbaijan supported the designation of the Bolshevik artificial famine in Ukraine as 'genocide' at the United Nations, 'then you can forget about seeing Nagorno-Karabakh ever again.' Prince Andrew added that every single other regional President had told him of receiving similar 'directive' letters from Medvedev except for [Kyrgyz president] Bakiyev. ↑ "Israeli FM Lieberman in Moscow". Wikileaks. Retrieved 1 October 2016. The FMs discussed expanding bilateral economic ties, and Lavrov raised Russian concern that Israel was partaking in 'historical revisionism' that sought to blame Russia for the Ukrainian famine of the 1930s. ↑ Dobczansky, Jurij (2009). "Affirmation and Denial: Holodomor-related Resources Recently Acquired by the Library of Congress". Holodomor Studies. 1, No. 2 (Summer-Autumn 2009). ↑ Young, Cathy (31 October 2015). "Russia Denies Stalin's Killer Famine". The Daily Beast. Retrieved 30 September 2016. ↑ "Interview with Boris Borisov". Retrieved 30 September 2016. ↑ "Researcher: Famine Killed 7 Million in U.S. During "Great Depression" » Alex Jones' Infowars: There's a war on for your mind!". www.infowars.com. ↑ "Holodomor Hoax: Joseph Stalin's Crime That Never Took Place". sputniknews.com. Retrieved 30 September 2016. ↑ "Holodomor Hoax: West's 'Golden Embargo' and Soviet Famine of 1932-33". sputniknews.com. Retrieved 30 September 2016. ↑ Alexander J. Motyl (October 2010). "Deleting the Holodomor: Ukraine Unmakes Itself". World Affairs Journal. Retrieved 1 November 2015. ↑ Alexander J. Motyl (29 November 2012). "Yanukovych and Stalin's Genocide". World Affairs Journal. Retrieved 1 November 2015.